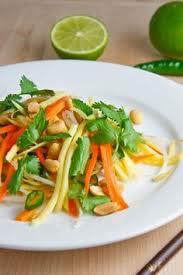 Our adaptation of the killer good Thai salad was chef approved. 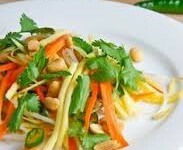 This salad can be served as is, or on a bed of salad greens. Makes an excellent companion to cooked fish or chicken. Delicious as a stir fry. 1) Whisk first 6 ingredients in bowl. Add shallot and set dressing aside. 2) Peel mangoes, then cut away chunks of fruit from pits and slice into thin strips. 3) Seed sweet pepper, slice into very thin strips and mix with mango strips. 4) Add carrot, half of green onions and cilantro. Toss gently to combine. 5) Add dressing and pinch of salt, toss to mix. 6) Sprinkle with nuts and remaining green onions.